Is there a dessert more mesmerizing than a Japanese cheesecake? This bouncy confection, also known as a Japanese cotton cake, is astonishingly light and—when cooked and cooled—will jiggle with the gentlest of prods. 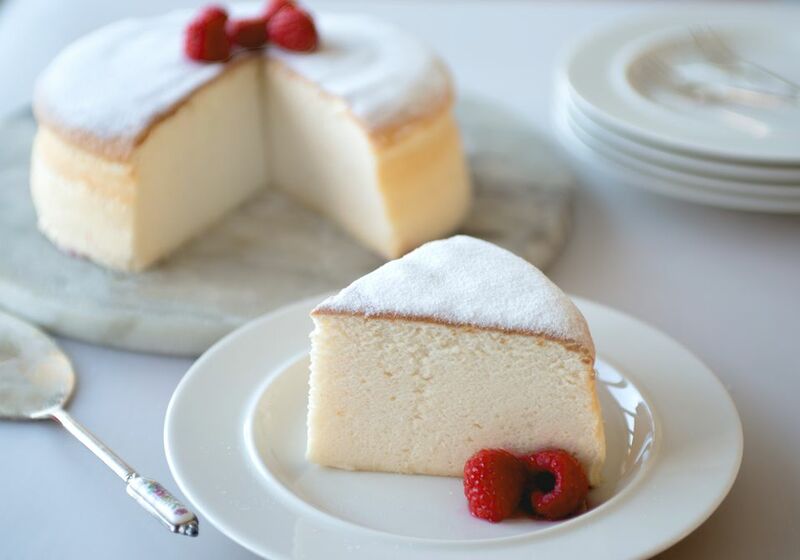 It's similar to a chiffon cake, but even airier and surprisingly sturdy (unlike the far more sensitive souffle, which is prone to collapse). The cake is less sweet than a regular cheesecake, resulting in fewer calories and making it a must-have dessert for those watching the scale. Here, the cake has just a hint of lemon, but switch it out for lime or a dash of liqueur if you wish. Note: while there are multiple steps to this recipe, this cheesecake is broken down into workable categories to help you better plan for preparation and cooking. Using 1 tablespoon of the butter, generously grease a loose-bottomed 8-inch cake pan and set aside. In a small saucepan, combine the remaining 4 tablespoons of butter, cream cheese, and milk. Slowly melt together over low heat, stirring constantly to prevent the mixture from burning. Tip the batter into a stand mixer bowl and on medium speed, whisk lightly to make sure there are no lumps. Sift the flour with the cornstarch and add to the cream cheese batter. Whisk again until incorporated. Add the egg yolks and sugar and whisk to create a smooth batter. Finally, add the salt and lemon juice and lightly whisk to mix together. Set aside while you prepare the meringue. ﻿In a spotlessly clean bowl, whisk the egg whites on medium speed using a stand or hand mixer until the egg whites are starting to turn opaque. Do not be tempted to rush this process; using a slower speed is best. Once opaque, add the cream of tartar all at once and continue to mix. The meringue will start to turn bright white and glossy. Now, add the sugar in three parts, whisking each time until thoroughly mixed. The meringue will soon be thick, firm, and shiny. When you lift the beaters from the mixture, it will stand in firm peaks. Using a large metal spoon, add 1/3 of the meringue to the cream cheese batter and mix quickly to loosen the mixture. Add another third and use the metal spoon to gently fold the meringue in keeping as much air as possible in the cake. Repeat with the remaining meringue to form a light, airy cake batter. Slowly pour the batter into the cake pan. With the back of the metal spoon, gently level the batter, then lift the cake pan 6 inches from the work surface and drop back down; this is to release any trapped air bubbles from the pan. Place a deep roasting tin onto the middle shelf of the preheated oven, put the cake pan in the center, and pour boiling water into the roasting tin halfway up the cake pan to create a water bath (bain-marie), which helps in gently cooking the delicate cheesecake. Cook for 1 hour, then turn off the oven and leave the cheesecake in the oven with the door closed for a further 45 minutes. Open the door and leave for a further 15 minutes, which will help in gently lowering the temperature of the cake thus preventing it from collapsing. Take the cheesecake from the oven, place on a cooling rack, and leave to chill. Once the cake is cold, serve covered with powdered sugar. The cheesecake can be placed in an airtight container and will keep for 24 hours in the refrigerator. The cheesecake is delicious just as it is drenched in powdered sugar, but a little fresh berries make it so much prettier. Raspberries work very well with the lemon in the cake, but blueberries and strawberries will also be delicious.